To me, tiny places have always felt like safe places. I had the normal childhood fascination with building blanket forts, of course. I draped quilts and comforters over chair backs and hauled cushions and stuffed animals into my sheeted den, delighting in the way I could shut out the world with a cottony veil. But I think my obsession with creating small spaces within larger ones probably had a lot to do with my anxiety and the desire to establish some sort of control. I have a theory that this is what the “tiny house” movement is all about. Forget carbon footprints and soaring housing prices. We’re all just looking for a little bit of peace. My niece, who is a tiny person with big anxieties, has a hiding place in her closet where she goes when she feels unsafe. When my sister told me about it, I thought it was a genius solution for a preschooler to come up with on her own: if you’re overwhelmed, find a small refuge. A closet must feel so much more manageable to a 4 year old. I, too, had a hidey-hole in my closet until well into my teens. It had pillows, a lamp, and just enough room for me to sit with my legs outstretched. Until I heard about what my niece did when strangers came over, I’d forgotten about it, but as my sister spoke, I had a sudden, vivid memory of crawling into the nest I’d made by shoving my hanging dresses and jackets to one side my closet. I remembered how I would nibble stacks of peanut butter and jelly Saltines and sip iced tea while devouring books like The Diary of Anne Frank and The Borrowers – stories about hiding and smallness. 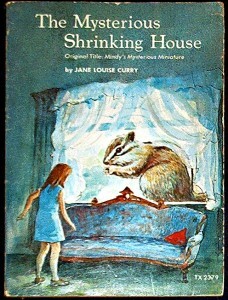 One of my favorite books was The Mysterious Shrinking House by Jane Louise Curry. It begins with a young girl, Mindy, discovering an old dollhouse at an estate sale and feeling instantly drawn to it. It’s beautifully crafted – in fact, almost too perfect, as if every piece in the house was once full-sized and then somehow miniaturized. As the story unfolds, we learn that Mindy’s dollhouse is actually the childhood home of her feisty neighbor, Mrs. Bright. Long ago, when Mrs. Bright was a teenager, she rejected the marriage proposal of a strange young man who claimed he had invented a miraculous machine that could shrink warts. It turns out the machine was capable of shrinking much bigger things, and the jilted suitor took his revenge by miniaturizing Mrs. Bright’s home one day while everyone was away at the fair. I won’t give away more than that, because this book is a delightful read if you can find it. (I recommend checking Alibris.) As a child, I was smitten with the idea of a dollhouse that had once been a real house. Reading the book as an adult, with my daughter, I loved the dynamic of a young girl and an old woman having fantastic adventures together. And in case you are wondering if the story holds up – it was published in 1970 – my kid gives it an enthusiastic thumbs up. 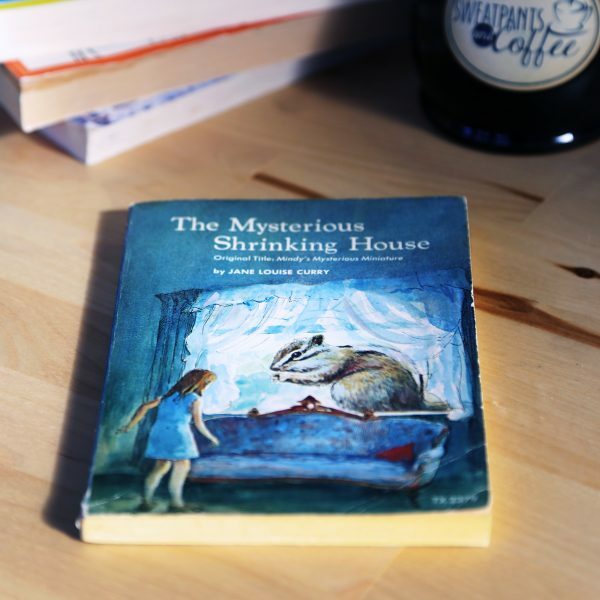 My copy of The Mysterious Shrinking House, which I found on Alibris for 99 cents. This is the cover I remember from when I was a kid. I no longer build blanket forts unless they are for my daughter, but I do still seek refuge in small places and in good stories when I am feeling overwhelmed or when I just want to feel comfortable. In a busy, sometimes scary world, knowing how to create a good hidey-hole is important.